OTTAWA — The Canadian charm offensive deployed to secure the new North American free trade deal in the face of a protectionist White House has gone dark even though the agreement faces a perilous path to ratification in the U.S. Congress. Andrew Leslie, the parliamentary secretary to Foreign Affairs Minister Chrystia Freeland, said Wednesday he is confident the U.S. and Mexico will ratify the deal, but Canada won't interfere with each process. Canadians, he noted, would not want others trying to influence the domestic parliamentary process. While cabinet ministers spent much of the first two years of Donald Trump's presidency lobbying hundreds of state and federal politicians, business leaders, unions — and anyone else with any influence and a willingness to listen — to convince a wary U.S. Congress to green light the agreement, the Canadian charm offensive is now on ice. "There's a good argument to be made that Canadians are always charming, but there's no over-emphasis on that scale down in the United States," Leslie said, prior to the Liberals' weekly caucus meeting on Parliament Hill. In September, the three countries signed the U.S.-Mexico-Canada Agreement, but the deal still needs to be approved by the legislatures in each country. Canada will introduce legislation on the deal in the coming weeks, while Mexico's Senate needs to vote on the agreement. In the United States, ratification is up to a now divided Congress, where Democrats control the House of Representatives and Republicans command a majority in the Senate. Many Democrats are skeptical of the deal's environment and labour protections and leery of supporting anything with Trump's fingerprints on it. On Wednesday, Rep. Earl Blumenauer, a Democrat from Oregon, told his Twitter followers that he doesn't see a way forward for the agreement in Congress if it doesn't do more for American consumers on pharmaceuticals — a demand that would almost certainly require renegotiation. "Talking to other members, my strong first impression is that there's a lot of work needed on access and cost of [prescription] drugs in NAFTA 2.0 to get committee support and House passage," he tweeted. "Many other significant concerns with provisions relating to the environment, labor, and enforcement all need strengthening. Trying to force consideration of this trade deal prematurely is not a recipe for success." Foreign Affairs Minister Chrystia Freeland, in Washington for talks on the fight against terrorism in the Middle East and trade meetings on Capitol Hill, was quick to pour cold water on the idea of reopening the talks. "Canada has done its part," she said after a meeting with Sen. Jim Risch, the chairman of the Senate foreign relations committee. "Canadians know that the negotiation was difficult at times, and Canadians know that at the end of the day, we got the deal done. That was Canada's job when it came to the negotiations with the U.S. and Mexico; Canada's job now is to pursue our own domestic ratification processes, our own legislative process, which is a serious one, and something we'll be doing with care and attention." Leslie said the government isn't directly reaching out to Democrats. Prime Minister Justin Trudeau indicated Wednesday that Canada's efforts are largely focused on ensuring ratification of the trade agreement coincides with the White House agreeing to lift punishing tariffs on Canadian steel and aluminum imports. "We continue to work with the American administration, with a lot of people in Congress, who do feel rightly that these tariffs are hurting American workers like they're hurting Canadian workers and Canadian industry," he said on his way into the caucus meeting. "The president has, you know, stuck to his approach on tariffs even though it's hurting the American people as well." 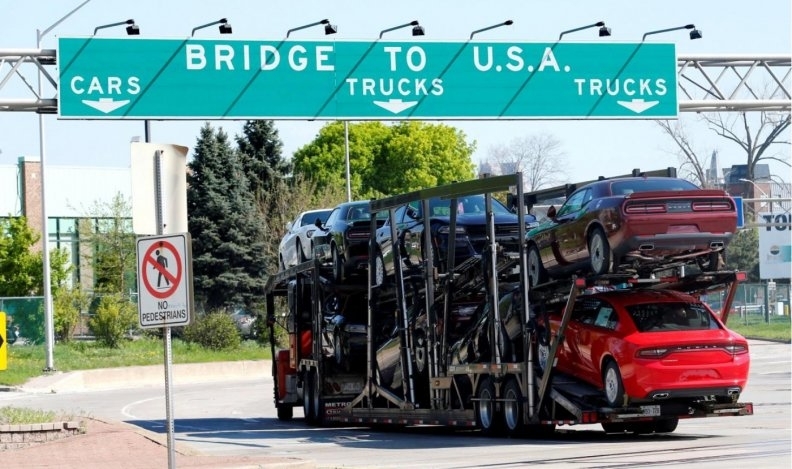 Trump imposed the tariffs in May, arguing Canadian steel and aluminum posed a national threat to U.S.
Canada retaliated with tariffs of its own on steel, aluminum and dozens of other products to equal the value of the Canadian exports affected by the American levies. The government targeted industries in states of prominent U.S. Republicans, hoping to get those politicians to pressure the White House to lift the tariffs. Canada has collected about $1 billion from those tariffs. Ontario and Quebec jointly wrote to Trudeau this week asking him to do more to distribute that money and even revisit the ones that aren't having the intended effect. Ottawa immediately rejected that idea, saying it would not surrender. Dean Allison, the Conservative critic for international trade diversification, said it's disappointing the Liberals have backed off the lobby effort to get USMCA passed, but said getting the tariffs lifted should be their top priority. The party's deputy leader, Lisa Raitt, said Wednesday she wants to know why the $1 billion hasn't flowed to help workers and companies in Canada hurting from the U.S. tariffs. The Liberals pointed to $150 million announced for Algoma Steel in Sault Ste. Marie, Ont. in January, and nearly $50 million last fall for ArcelorMittal Canada, which has plants in Ontario and Quebec. Leslie said the government is reviewing hundreds of submissions about how to help Canadians weather the tariffs. "Obviously, because of the large number, there's a certain amount of time to prioritize them and to get the money out the door," he said. "I'm very confident that process is unrolling the way it should. But can we do better? Absolutely."